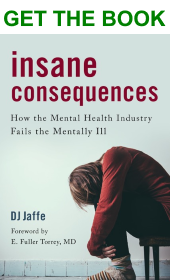 Advocacy Alert: Money available for your state hospital….John Stossel interviews DJ Jaffe….Our controversial TEDTalk…Our Washington Post oped….How to reduce the mental illness to jail pipeline…. Fed. Serious Mental Illness Committee Reports on Needs of Seriously Mentally Ill…. 18% of population over 18 (43 million) has ‘any’ mental illness. 4% of population over 18 (10 million) have ‘serious’ mental illness (SMI). This site focuses on serious mental illness. Random acts of violence by minority are tarring the majority. Use Assisted Outpatient Treatment (court ordered outpatient treatment) for those with a history of violence dangerousness or multiple rehospitalizations due to noncompliance. Reform HIPAA so parents of mentally ill can help loved ones. If you are talking about the 40-50% of Americans who may have a “diagnosable mental disorder” during their lifetime (18% annually), then ‘no’, the mentally ill are not more violent than others. If you are talking about the 4% of Americans with the most serious mental illnesses that affect daily functioning–primarily schizophrenia and treatment-resistant bipolar disorder, then ‘no’, the mentally ill are not more violent than others. If you are talking about the subset of the 4% group who go off treatment that has previously prevented them from being psychotic, hospitalized, or violent, then ‘yes’ the mentally ill are more violent than others. This higher than normal rate of violence increases even more when these groups abuse substances. When people ask, “Are the mentally ill more violent“, they are usually asking about this group, the most seriously mentally ill who are not in treatment. Violence is almost always associated with going off treatment and becoming delusional or psychotic. There are many reasons people with serious mental illness go off treatment. Some reasons are not unique to mental illness while others are. The ability to regulate behavior is compromised because the brain is the organ affected. Anosognosia: Up to 50% of people with schizophrenia and many with bipolar lack insight: they are so sick they don’t know they are sick (anosognosia). Costs/Side Effects: Some refuse treatment because of costs, side effects, lack of support, etc. Civil Liberties: A misunderstanding of civil liberties, the nature of mental illness, combined with misinformation leads us to protect the right of the psychotic to ‘die with their rights on’ rather than mandating violence preventing treatments that can restore free will. Reaction to hallucinations and delusions. When people with serious mental illness act out, they are often doing so as a logical reaction to their delusions, hallucinations, and paranoia. If you think someone is the Devil and trying to kill you, you will try to hurt them first. Misplaced Funding: Most money spent goes to improving mental ‘health’ not treating mental “illness”. People with serious mental illness are usually sent to the end of the line, rather than the front. The ability to get services is inversely related to need, therefore people with serious mental illness find it difficult to get services. Mental health providers often discriminate against highly symptomatic people with serious mental illnesses. Almost everyone has issues with involuntary commitment and involuntary treatment. This site rather than saying “it’s a difficult issue” and dropping it, attempts to study the science and law to come up with policies that balance the right of patients to have freedom, their right to receive treatment, the public’s right to safety, and sound fiscal policy. And while not advocating mass institutionalization, we recognize that the dearth of hospital beds has caused mass incarceration. Does Olmstead requires states use AOT? National Sheriffs Assoc endorse AOT. • _91% were successful in reducing or avoiding time spent in inpatient psychiatric hospitalization. • _88% were successful in reducing or avoiding time spent incarcerated. Off-topic: My wife and I were in Sri Lanka during later part of civil war and after Tsunami. Had grand time as there were virtually no tourists. Met these students on beach. Feel awful what's going on there.